Each year following On the Table, the Chicago Community Trust hears from excited and passionate community members about the conversations they had and the ways in which they want to make a difference on a local level. This year, the Trust will help ensure creative and actionable ideas raised during the discussions come to fruition. To this end, the Chicago Community Trust has invited all individuals and organizations to submit a short video featuring their table’s idea of an actionable task to benefit your community. Some ideas included planting a community vegetable garden to buying school supplies for a classroom in need; cleaning up a local playground to supplying dinner for a week at a local soup kitchen. In essence – what could participants do with $1,000 to benefit their community? 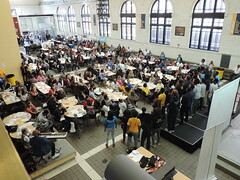 On June 28, Chicago Community Trust will announce up to 50 On the Table participants who will receive a $1,000 Acting Up award to implement their idea. The charge is simply to encourage people to work together and take action for the public good. Here is a copy of the NLCCC video submittal. 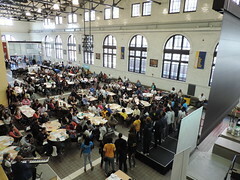 Regardless of the outcome of the competition, we thoroughly enjoyed participating in several On the Table discussions on May 10th and have come back with a number of ideas that may be incorporated into our community planning process.